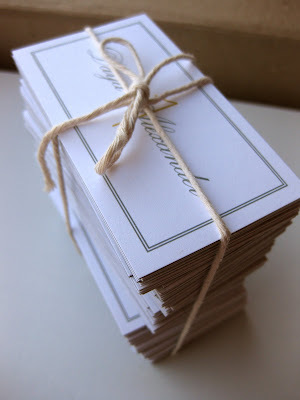 the place cards... simple rectangle of double fused card stock with yellow table number behind the guests name. the program: printed in pewter ink, a triple fused narrow rectangle with information on front and back. tables numbers used the same fabric as the invitations. the directional signs: simple arrow shape of wood with the couples monogram and hand painted yellow flowers. and finally, the thank you notes... the notes are simple with the couples monogram in pewter ink on white card stock. the corresponding pewter envelopes are lined with printed paper that matches the fabric used throughout the suite.